A very handsome Stirling…isn’t he gorgeous? I have always had a thing for animals of all kinds. My mother loves to tell people about the various “stray” cats and dogs I would bring home. I fell in love with Golden Retrievers early on, and once my hectic life slowed down enough to bring one into our home, we got our first golden charmer. Stirling introduced me to a whole new world, and I haven’t looked back since the moment I laid eyes on him when he was just 2 days old. He opened up a part of my heart I never knew existed, and I am forever grateful to him for that. He has taught me so much. I quickly discovered that Goldens are kind of like potato chips – you can’t stop at just one. A year later, Willow came to join us. She immediately charmed us with her regal manner, and I seriously started to think about this conformation showing thing. A few private lessons followed, and then there we were at our first dog show. The rest as they say is history, as I found myself severely afflicted by what those in the know refer to as “the bug”. It took us awhile to get the hang of things, but we persevered and both Willow and Stirling earned their Canadian Championships with varying degrees of style and finesse. Somewhere along the way I developed a liking for English style golden retrievers and decided that one was needed at Coppermoon. 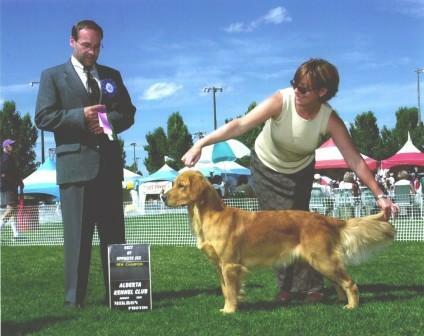 In August 2002, I contacted Gerdine ten Hagen of Dazzling Gold Golden Retrievers in Holland. She had just bred a lovely litter of puppies with an intriguing pedigree and gorgeous parents. Before I knew it I was jetting off to Amsterdam, where Gerdine offered warm Dutch hospitality and an opportunity to learn lots about European goldens. The wee pup Autumn and myself flew home to Calgary in style, she in front of me on the floor in her designer soft-crate, and she was quite the hit on our United Airlines flight from Amsterdam. Unfortunately Autumn didn’t have very good eyes, so she couldn’t be part of our breeding program. She now resides on Vancouver Island as a much loved pet dog. However, we were so impressed by everything about Autumn that we decided to try again. Gidget became part of the Coppermoon family in April 2004. She is really something! 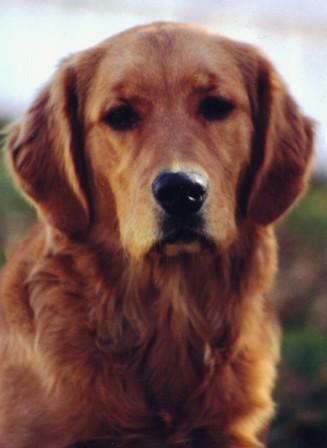 On a cold November morning in 2002, the inaugural breeding of Coppermoon GoldenRetrievers resulted in the whelping of 11 beautiful puppies. Willow did brilliantly, and I was quite calm considering. The puppies were all healthy, and for the next 2 months, everyone here was busy nurturing our precious little gifts. The little ones are no longer little and are greying about the muzzle. Some have passed on now which saddens me. I learned a lot from that litter. That brings us to where we are now. I have come quite a ways since Stirling and I first met. I couldn’t have come this far without the help of some very special people. I’ve been extremely fortunate to have several experienced breeders help me along the way, and I am grateful for their encouragement and their willingness to share their knowledge with me. Coppermoon has bred a few more litters since our inaugural breeding, and I’ve learned several things along the way. The most important is to not take myself too seriously and to keep things real, about the dogs, and about this wonderful breed we call the Golden Retriever.